Brazil’s biggest independent brokerage, Grupo XP is planning to launch Bitcoin and Ethereum trading platform before the end of 2018. The Grupo XP’s CEO, Guilherme Benchimol disclosed this on Thursday while speaking at an event in Sao Paulo. Brazil’s biggest independent brokerage is stepping into the cryptocurrency market in the coming months with the mission to help over 3 million Brazilian investors to trade cryptocurrencies. At the moment, cryptocurrencies are gaining popularity in Brazil as investors are 5 times more exposed to the number one digital virtual currency, Bitcoin as they do stocks. The sheer popularity of the digital coin has influenced the company’s plans to launch the trading platform into the markets. I must confess, this is a theme I’d rather didn’t exist, but it does. We felt obligated to start advancing in this market. The new exchange named XDEX will be operated by Thiago Maffra independently of the firm’s other trading platforms. This move comes as the government of Brazil has already taken the first steps in approving cryptocurrency markets with stable financial services. With the release of XDEX, the Brazilian Securities and Exchange Commission (CVM) has released a comprehensive document that features guidance to fund managers who would be interested in adding cryptocurrencies to their portfolios. With Grupo XP setting the pace, coupled with the support from the government, it is now possible for Brazillian cryptocurrency market to see the emergence of established exchanges that are currently seeking international expansion. Bitcoin price has started the downside correction at the beginning of this week as technical indicators send bearish signals. This means that the bears are in charge for the time being. What should traders expect next? Will the bearish move continue or would the price rally further? So far, BTCUSD sellers have been resilient as they have retested $6,000 level for 6 times. Every time they did, they fail to breach this level. 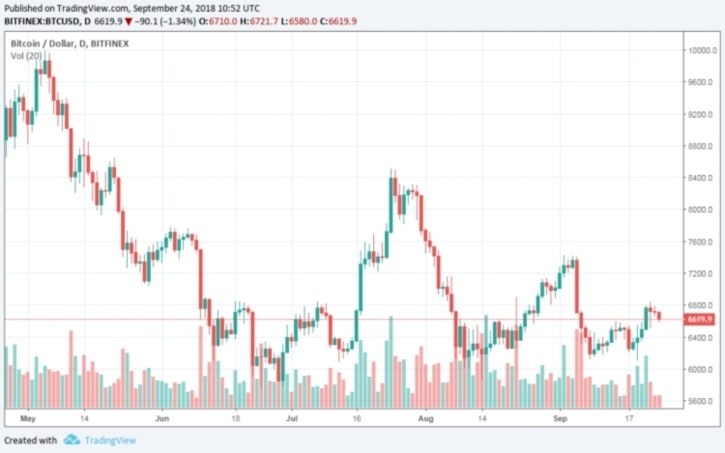 At 12:05 GMT, the BTCUSD pair tested $6,620 as the bulls fight to keep the price above this level. A support, however, must be established above this pivotal level as Bitcoin is focused on breaking $6,620 resistance to avoid a retreat towards $6,500. The next important support is at $6,580.